adel_tool_company has no other items for sale. 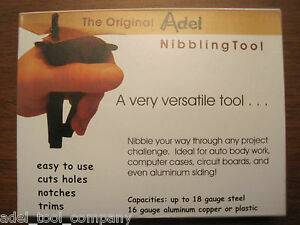 The Adel Nibbling Tool is ideal for a wide range. How to use the Original Adel Nibbling Tool. The correct way to hold the Adel Nibbling Tool. By turning the Adel Nibbling tool before each cut, a 5/16" radius (min.). Great tool! Works well. Made well. Highest quality parts make this nibbler put the Chinese lookalikes to shame ! Highly recommend for the hobbyist and professional. Great product. Especially glad that it's made in the U.S.A. Better to have one then need one!